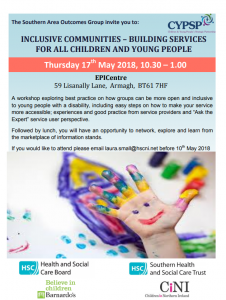 The Southern Area Outcomes Group are hosting a workshop exploring best practice on how groups can be more open and inclusive to young people with a disability, including easy steps on how to make your service more accessible; experiences and good practice from service providers and “Ask the Expert” service user perspective. This entry was posted in Southern Outcomes Group and tagged news/events, southern-og by Michael. Bookmark the permalink.